Bring the coke to a boil…be sure that it is actually boiling and not just bubbling from the carbonation. Once boiled add the coke to the Jell-O and stir until dissolved. Let sit for a minute and then add the cup of Jim Beam and stir again. Pour into the shot glasses and place in the refrigerator to solidify. Cheers to Cinco de Mayo! What is the first thing that comes to mind when you hear that it is Cinco De Mayo? If you are like many, you think “I am going to have a margarita..or two!” I thought the same thing, only with a little bit of a twist. I turned my Margarita into a Jell-O shot! Interested in trying it out…here it is! Pour the boiling water into a bowl with the package of Jell-O and stir until dissolved. Let sit for a minute; add the tequila and mix together. Pour Jell-O into your shot glasses and refrigerate until solid. I ordered Margarita flavored Jell-O online as it is not a common flavor. If you have the time, order it, but if not you can also use lime or lemon Jell-O however that will change the flavor slightly. If you are going to use a basic flavor I suggest substituting 1/4 cup of the tequila with Cointreau; this will help it from just becoming an overpowered tequila and lime shot. – salt the rim (or half)… not everyone wants salt with their margarita, but for those who do rub a lime around the rim of the glass and dip in salt. If you want to make it more decorative just salt half. a little bubbly to add to the fun! I have been thinking of a couple of new ideas for Jell-O shots outside of the normal, and have been stuck for a while…until a recent grocery trip. I always have to make my way to the Jell-O section of the baking isle and this time I came across peach flavored. I haven’t seen this before and instantly grabbed the box and began thinking about what I could add to it for a shot. 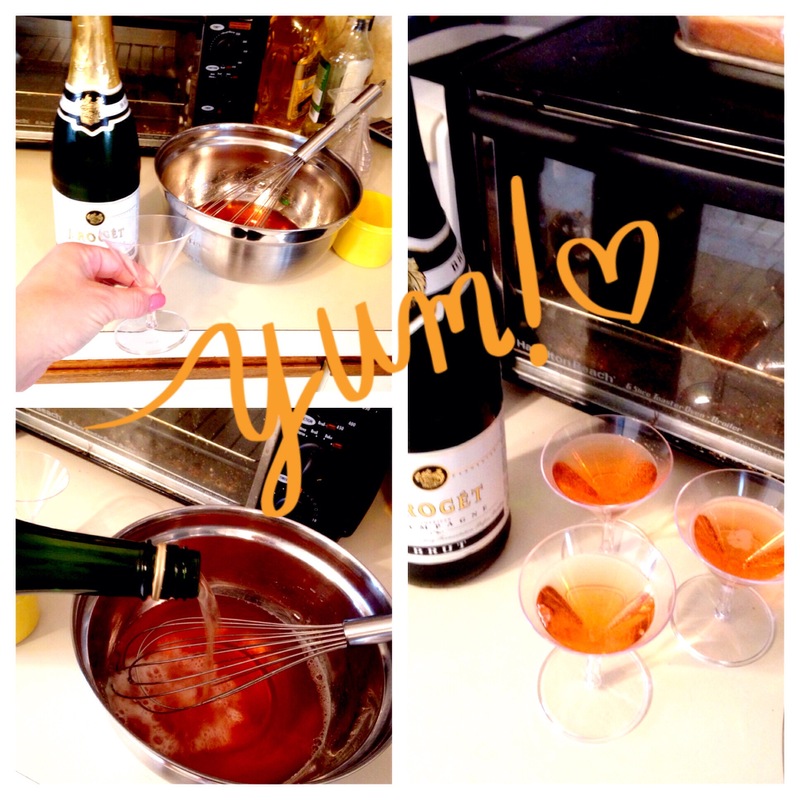 **Lightbulb** we have champagne in the fridge, I am going to make a Peach Bellini Jell-O shot. I must admit I was nervous having never used champagne before for a Jell-O shot, but let me be the first to tell you, it was pretty great! Per usual, add a cup of boiling water to the Jell-O mix and stir until dissolved. Wait a few minutes before adding one cup of champagne. Champagne, like soda, has a good amount of carbonation/ bubbles so when you pour it into the measuring cup be sure to let it settle a little so that your measurement is accurate. I added an extra into the bowl as well, since champagne isn’t as strong as some of the other alcohols I use, it isn’t overpowering even if you add a little extra. I chose to go with a mini martini glass for these shots, but you can use anything. Put into the fridge to solidify before enjoying. As the weather is slowly getting warmer, thoughts of spring and summer are coming to mind. And with those thoughts comes the desire for ice cream, popsicles, and delicious drinks….or all combined into one. And so…I give you the creamsicle. Pour the boiling water into a bowl with the orange jell-o and mix until dissolved; let sit for a minute. Add 1 cup of vanilla vodka and mix. Place into your shot glasses and put in the fridge to solidify. There is a bite at the end where the vanilla comes into play, but it definitely adds to the shot. Another idea for this shot would be to add whipped cream (or adult whipped cream) before enjoying! An easy and refreshing cocktail, a rum and coke is very much a go to drink for many. It requires little to no work, and can be made using almost any flavor of rum; personally I go for Malibu. 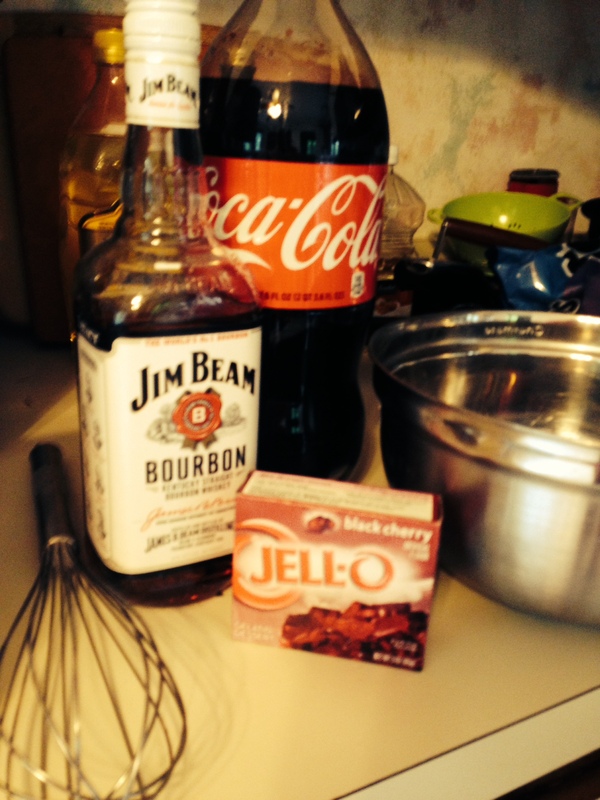 This weekend I decided to make a rum and coke with a twist…that twist: turning it into a Jell-O shot. This is a little different because instead of using a cup of boiled water, you are actually going to boil the soda and add that to the jello. Stir until dissolved and let sit a minute before adding the rum. 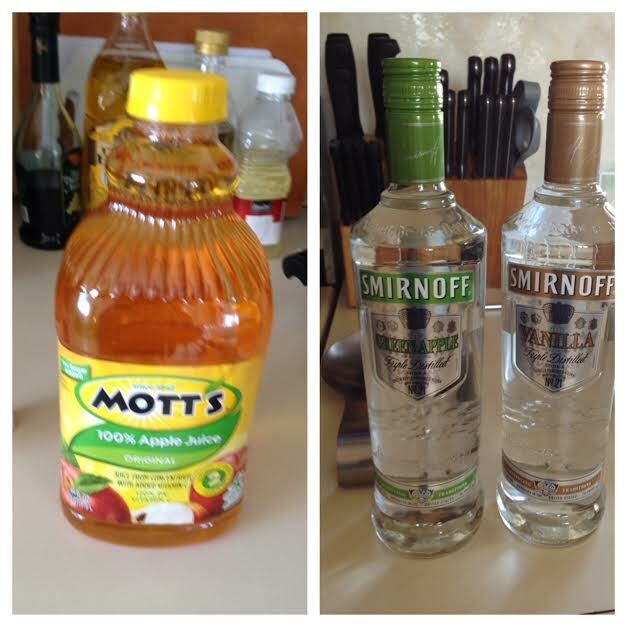 Mix together, pour into your shot glass and put in the fridge to solidify. I wasn’t too sure about the black cherry when I initially started, but it actually enhances the taste of the coke, without making it have a strong cherry flavor. However, if you prefer the taste of cherry coke, you could use that instead of regular coke to enhance the cherry flavor. I recently had a drink of cherry coke and cherry rum….never would have thought of it, but it is delicious. So, if you want a rum and coke that is a little sweeter and has a stronger cherry flavor, try this shot with substituting the coke with cherry coke and use cherry rum. I think one of the best things about this shot is that the possibilities seem endless. You can use plain rum, coconut (which is what I did for these), cherry rum, or even banana…. When you think about some of your favorite candies from childhood, one of the ones that always comes up is Jolly Ranchers. I mean, who doesn’t like jolly ranchers? Well, this weekend I went to Brooklyn to visit my best friend to celebrate her birthday, and what better way to celebrate than with jello shots? Now, I needed to think of a jello shot that could some how incorporate how awesome our friendship is, which was pretty hard given all the years we have known each other, the different drinks we have tried, and the different types of alcohol we both enjoy. Then, light bulb!, we have known each other since we were kids, so why not take something from our childhood and make it into an adult form?! 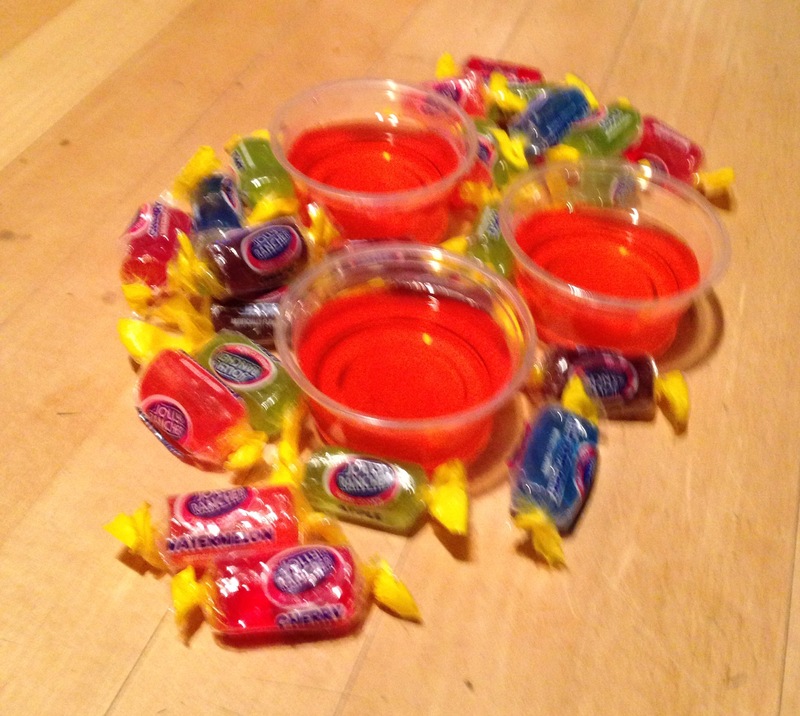 And so ladies and gentlemen, I give you jolly rancher jello shots! Follow the standard directions for making the jello; boil one cup of water and add to jello powder. Stir until dissolved. Let sit for a minute before adding the alcohol (it doesn’t matter if you add the pucker or the vodka first). Mix well and pour into your shot glass. Place in fridge until solidified. For added fun, get some actual jolly ranchers! We have all heard the saying “Everyone’s Irish on St. Patrick’s Day!” and now, you can say that everything is also Irish on St. Patrick’s day. You go into any bar on St. Patrick’s Day there is about a 99.9% chance you are getting served green beer. People who don’t even have a speck of Irish in them dress up in their green outfits and have the time of their life, because honestly, the Irish know how to party…We even know how to make your morning coffee that much better and with that being said, I give you the “Irish Coffee Jello-Shot”. Now, I had a few non believers when I mentioned wanting to make an Irish Coffee jello shot, but here is the recipe to prove them wrong! Put your coffee in a saucepan (the coffee should be cold, but do not use ice because we do not want to dilute the flavor) and sprinkle on the gelatin. Let this sit for a minute before turning on the heat and mixing until the gelatin is dissolved. Once dissolved add your liquor and mix again. 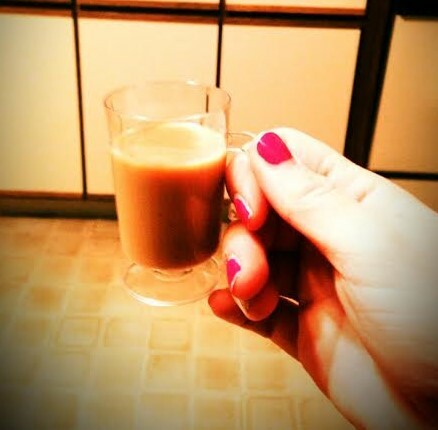 Pour into your shot glasses of choice; here I chose to go with mini mugs to go along with the coffee theme. Put in the fridge until they solidify and enjoy! A fun and festive Jello- Shot that is sure to bring out the Irish in everyone! Happy March! Although, wait….isn’t March supposed to mean we are close to spring? For all of you New Englanders out there, it is clear that this could not be as far from the truth as possible this year. 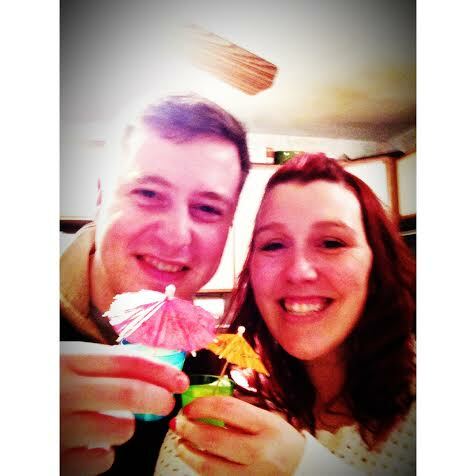 Like many of us Bostonians, I am not so secretly wishing I was somewhere on a tropical island enjoying a fruity little drink with an umbrella in it (let’s be honest the umbrella really makes the drink)! I may not be able to be on a tropical island right now, but I can enjoy an umbrella drink, or in this case, an umbrella jello shot. Here’s how to escape reality and get away for a little while…. Per usual, add the boiling water to the jello mix and stir until the powder is completely dissolved; let sit for a minute and then add the rum and stir again. 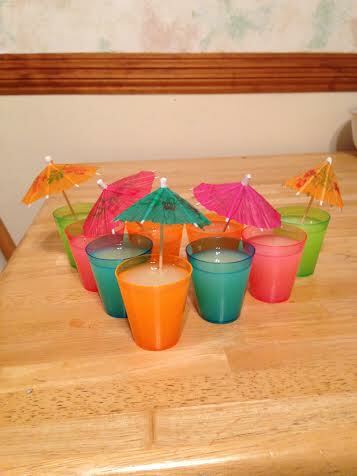 Pour into shot-glasses; this time I chose to go with the bright colors as they made me feel a little bit more “summer-y”! Put the shot glasses in the fridge (*note: the glasses I chose this time do not have covers, so make sure you have the shelf space in the fridge for them). Once they have solidified, add an umbrella and enjoy! Now you can have summer all year long…or at least the summer beverages)… Cheers!! This was a two-part shot so it takes a little bit more time than others. Once your shots have become Jell-O, you can create the whipped cream topping. Take your cool whip and add the vodka, not too much that it becomes more or a liquid, but enough to get the flavor; mix together. Add to the top of the Jell-O shots and freeze again until the cool whip has solidified. This shot was a trial by error type of Jell-O shot, and although it still was pretty good, I think there is a way to make this a lot better. After the first part was solidified I had my boyfriend (the official quality control) taste on with me. It wasn’t bad, but the apple flavor was lacking more than I would have liked. We concluded that this was probably because the apple juice was a little watered down and once the vodka was added it overtook the flavor of the juice. Next time, I think I need to try it with an apple cider or something more concentrated to really give that apple flavor….and, we may need to stick to just the apple vodka for the ‘pie’ portion and leave the vanilla just for the whipped cream. We did however notice a difference once the whipped cream topping was added as it definitely enhanced the flavor of the overall shot. 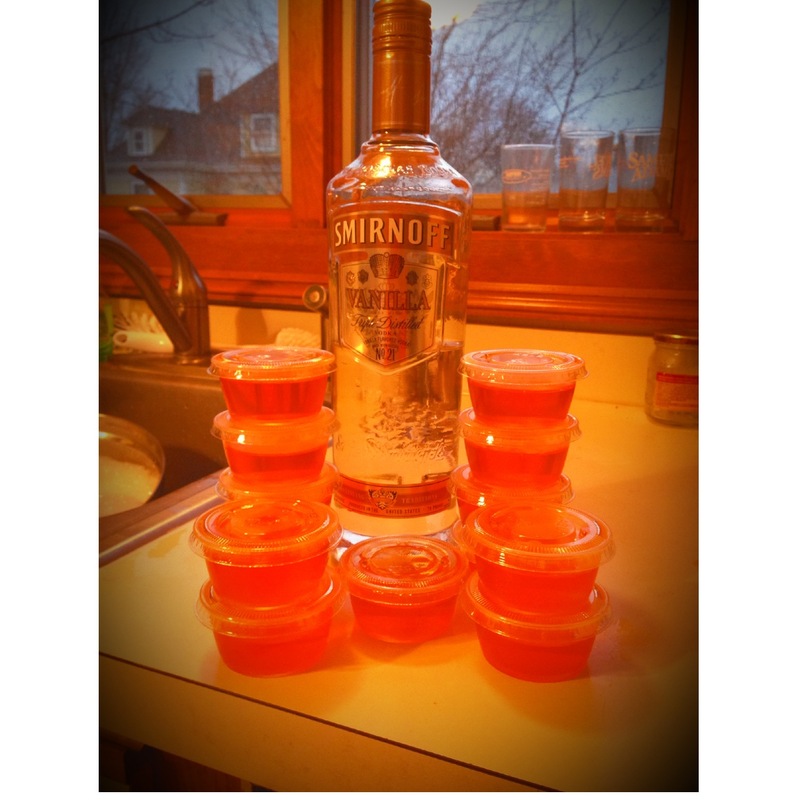 The verdict, if this went to a party people would enjoy them, BUT I think that there is potential for these to be better and a little more flavorful… Keep your eyes posted for the next apple pie Jell-O shot recipe and so much more! Realistically speaking, this probably should have been the first post I put up on the blog, but oh well. 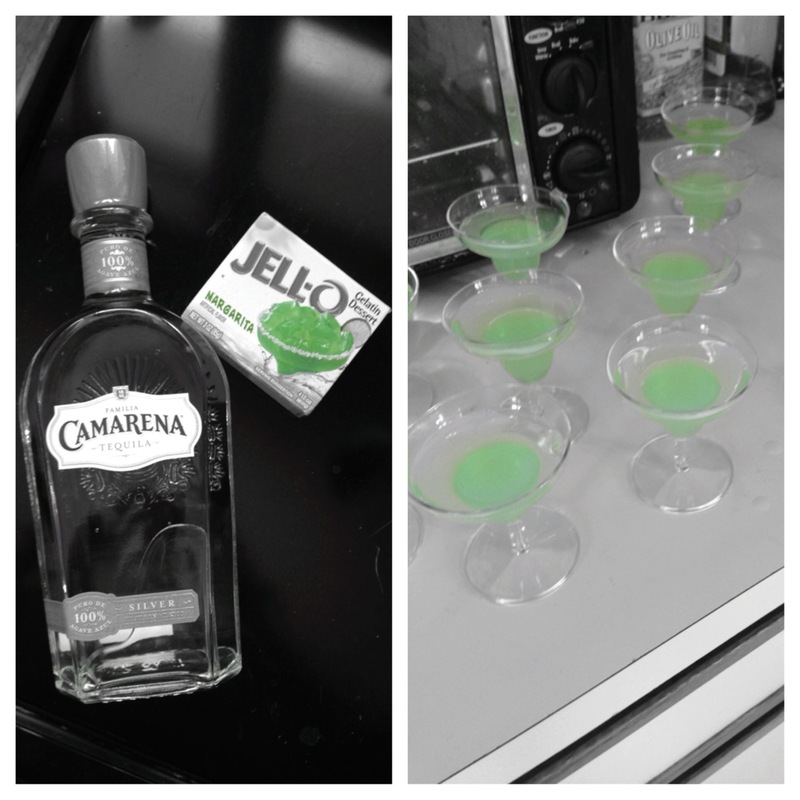 I already told you all how this blog came about; I love jello shots and friends encouraged me to write and share about all the fun recipes, serving methods, and even some stories involving jello shots. But, I guess I never really mentioned why I make jello shots. Sure, I initially made them on a whim to take to a party, but here is the thing, I absolutely LOVE parties. I am not talking the raging college keggers (although let’s be honest I enjoyed some of those), I mean themed parties, fun events for different occasions, small gatherings, big gatherings; those are the kind of parties I am talking about here. Growing up I wanted to teach, I worked with children for what feels like forever, I even went to school initially for teaching. Through the years, and a couple of bumps in the road, I ended up graduating with a criminal justice degree, I worked in a hospital, and now I am at a contracting company. I have loved all my working experiences (despite the hiccups that come along in any workplace), but if you ask my what my dream job would be, I always come back with the same answer: Event Planning! So, why have I had multiple jobs, none of which have this title? I wish I had a better answer for you, but it is a tough job to find especially in Boston. Who knows, maybe someday I will get to do that, but until then I take the next best thing…Jello shots (and then some). Despite not having the official title as event planner, I am more than happy hosting get togethers (or in some cases co-hosting) with friends and/or going to other people’s events as a guest. 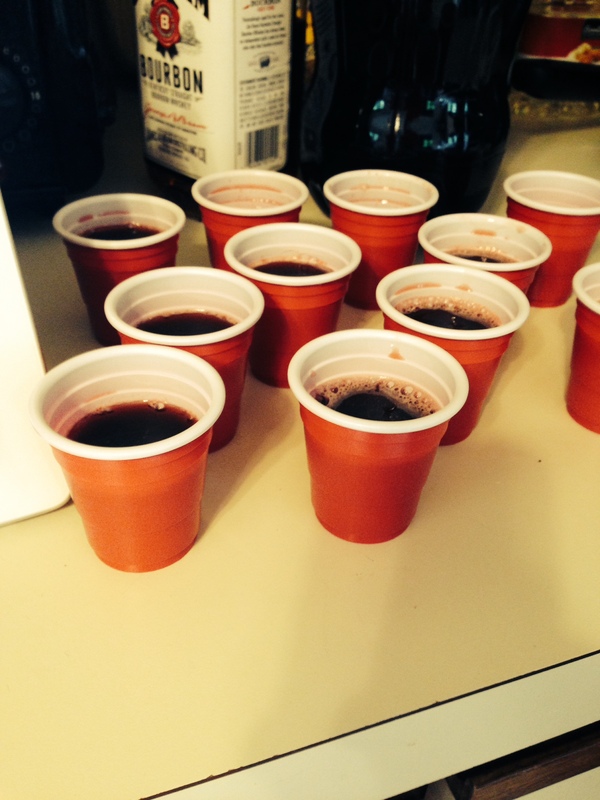 In doing so, I still get to live out my dream…the jello shots are a small part of that.